Becoming an ACE Certified Personal Trainer means you've made movement your mission by committing to deliver science-based health and fitness instruction to people everywhere. With a certification accredited by the National Commission for Certifying Agencies (NCCA) and built on the foundation of the ACE Integrated Fitness Training® Model, you will be equipped to deliver individualized programming proven to move people to adopt sustainable, healthy behaviors and a more active way of life. As an ACE Certified Personal Trainer, you'll elevate your mission of movement by leading your clients to healthier, more active lives. With our NCCA-accredited certification, you will learn to design custom programming and deliver effective, safe and enjoyable personal training experiences. Begin your journey to a new, fulfilling career. 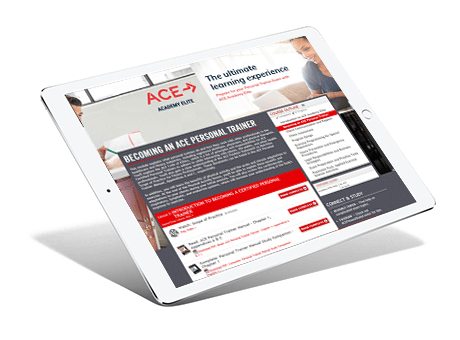 Take the first step in starting a moving career as an ACE Certified Personal Trainer. Choose the study program that works for you. The most popular and comprehensive program we offer. Enjoy everything in the Pro Essentials Study Program, plus a certification exam retest voucher and hard copy format of our manuals. A self-guided study program with the basic foundational material to prepare for the exam. Access ACE Answers, our self-serve resource center featuring a wide range of online study materials..
Move your career further as an ACE Certified Professional and save 20% on an additional ACE Certification. * This includes our Personal Trainer, Group Fitness Instructor, Health Coach and Certified Medical Exercise Specialist study programs. As a mission-driven nonprofit, we strongly encourage health and fitness professionals to seek out additional education, because we believe well-qualified professionals are critical to turning the tide on the physical-inactivity epidemic causing so many health-related problems around the world. Plus, holding multiple ACE Certifications will allow you to take your health and fitness career to the next level by allowing you to reach a wider, more diverse set of clients. As part of our commitment to foster career growth among ACE Certified Professionals, we have secured agreements from a wide range of health and fitness companies nationwide. Identifying yourself as an ACE Certified Personal Trainer or Group Fitness Instructor at 24 Hour Fitness, Anytime Fitness, Town Sports International, KoKo FitClub, Crunch, Steve Nash Fitness World and Sports Club, Orangetheory Fitness and Active Wellness Wellness will get you in the door for an interview for any qualifying position at those facilities. ACE educates, certifies and supports more than 85,000 health and fitness professionals, health coaches and allied health professionals. Earning our NCCA-accredited certification means that you’ve met the highest industry standard for health and fitness professionals – and that you’ve made movement your mission. At ACE, we go above and beyond to support our health and fitness professionals throughout their careers, through education, scientifically-rooted information, training, partnerships and advocacy. As a Personal Trainer, there are many ways to move people toward better health. Explore them all in our PT Career Guide. 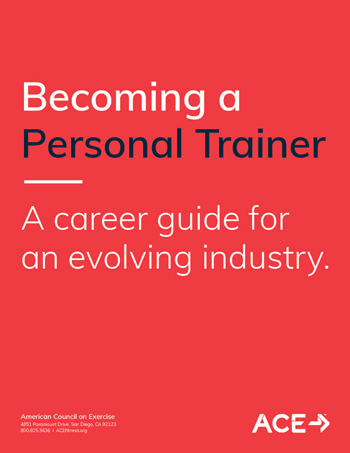 Explore your options for starting or furthering your career in the fitness industry as a certified personal trainer. 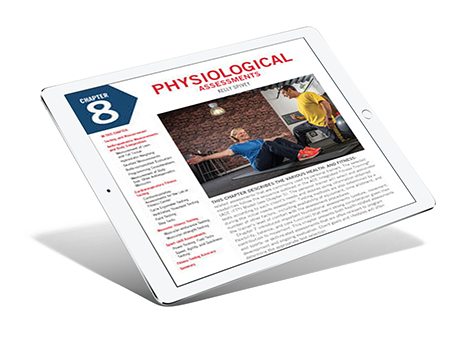 Study more efficiently and effectively for the Personal Trainer exam with easily-digestible content sorted into convenient lessons. Study for your certification anywhere and everywhere with this digital eBook. Ready to Make Movement Your Mission as an ACE Certified Personal Trainer?